Ms. Clyde was admitted to The Phoenix Rehabilitation & Nursing Center on April 16th, 2018, from an Acute Care Hospital – Brooklyn Hospital. She was admitted with the primary diagnoses of spinal stenosis, lumbar region without neurogenic claudication. She had difficulty in walking and muscle weakness and needed rehabilitation and recovery. When Ms. Clyde was admitted, she was greeted by the concierge at The Phoenix and was provided a welcome gift. She was very quiet and passive at first, but as she stayed longer, she was very happy with her new roommate and quickly became friends. Our concierge would often stop by from time to time to assist with any inquires, in part to ensuring that she was receiving the highest quality of care and customer service, a staple of The Phoenix community. Ms. Clyde was provided physical therapy as well as occupational therapy during her time here at The Phoenix. During the first weeks of her stay, her goals was set, and she was to work on the following: static standing, bed mobility, transfers, ambulation in distances, functional mobility during ADLs (activities of daily living), upper body dressing, lower body dressing, toileting, hygiene/grooming, commode transferring, and working on obtaining strength to be able to improve her lifestyle. As the weeks progressed, Ms. Clyde was able to improve from total dependence with attempts to initiate, to being able to complete a task a bit better with help. Most importantly, she was able to have a fair level of static standing. 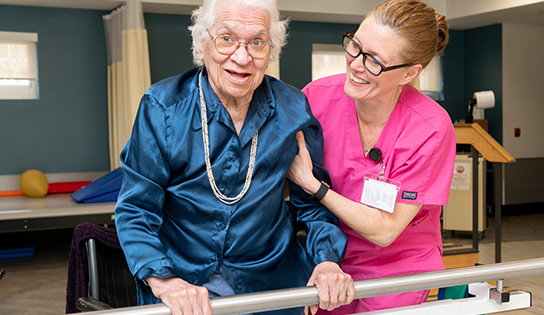 Along with maintaining standing balance for one to two minutes without upper extremity support, she was able to ambulate 60 feet from initially not being able to walk. During the final week of her stay, she was able to maintain standing balances without support against minimum resistances, and also, she was able to walk 150 feet with contact guard assist. She has achieved HPL (highest practical level) in therapy! Ms. Clyde was discharged on June 4th back to her home. Thanks to our entire team, she was given all the necessary tools and recommendations to support a better lifestyle at home. We’ve all enjoyed your stay Ms.Clyde, and wish you the best!